People have lived in southeastern Nevada for the past 13,000 years. The earliest inhabitants of the Colorado River Valley were the Mohave. Their name has been translated to mean “people who live along the water.” They lived in dwellings above the floodplain and farmed near the water. Historical petroglyphs can be found throughout the valley and within the recreation area. Europeans began making contact with area natives as early as 1540 when Spanish explorer Melchor Diaz traveled to the area. In 1776, explorer Francisco Garcés traveled to the area in search of a path to the pacific coast. He used four Mohave guides and crossed the river into present day Nevada. In 1964 Don Laughlin opened the first casino in the area, about six miles north of the recreation area. Over time, a town bearing his name was established. Additional casinos were built in the following decades and Laughlin, Nevada, has become a popular tourist destination. The establishment of the Big Bend of the Colorado State Recreation can be traced back to the Fort Mohave Land Act in 1960. This Land Act initiated the transfer of 15,000 acres of federal land in the Laughlin Big Bend area to the Colorado River Commission of Nevada, of which 2,100 acres were set aside for the Big Bend of the Colorado State Recreation Area. 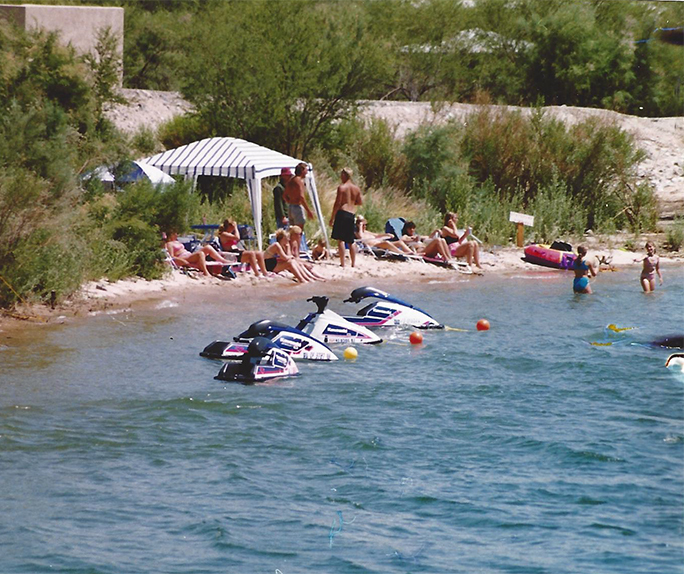 In 1991 the Colorado River Commission transferred the 2,100 acres to the Nevada Division of State Parks leading to the establishment and opening of Big Bend of the Colorado State Recreation Area in 1996.